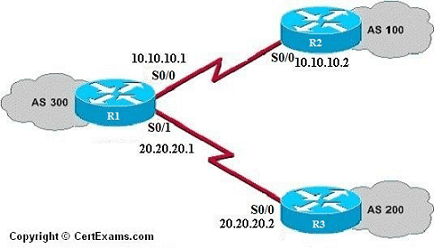 Description: Describes the commands for forming BGP neighbor relationships and advertising networks. 1. Assign the IP addresses to all the devices as per the diagram. 2. Bring all the interfaces to up. 3. Issue network command on all the devices to identify the networks to be advertised by the BGP process. 4. Issue neighbor command on Router R1 to identify each neighbor and its AS.